Attention is such a beautiful song that I couldn’t help but learn it and share with you the way I’ve worked around the main challenges the song presents. (NOTE: In case you aren’t familiar with some the above terminology, you might want to click on the red links to find out more about each subject before you carry on reading this post). Let’s go through the list, point by point. its volume doesn’t change massively going from one register to the other I would say that the perfect exercise to master the transition between registers are the sirens. With this exercise, which by the way also works extremely well to warm-up your voice, you sweep through your entire range, learn how to go across vocal bridges without cracking and become more aware of what register is the most suitable to be used at a given pitch for a specific song. 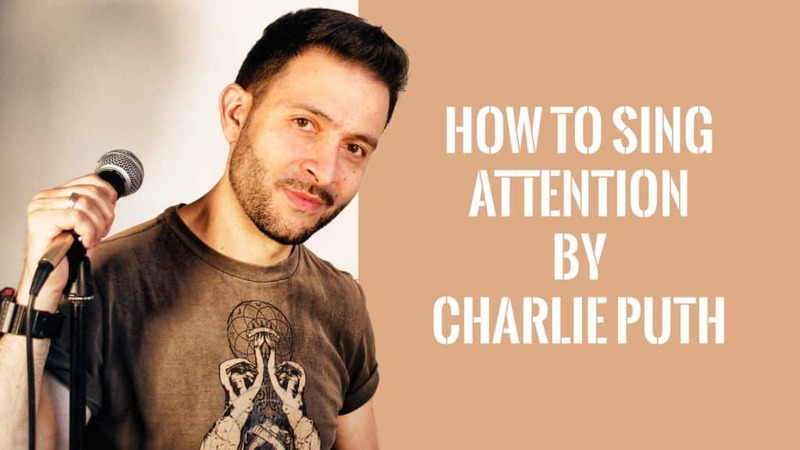 Exactly what you need in order to master Attention! 2. Some bits of the song are fairly high (i.e. the sentence “now that we’re right here standing face-to-face” in the second verse and the whole of the last chorus). You want to make sure that your voice sounds as open and relaxed singing those parts, as it does when you sing the more comfortable bits. No one wants to sound like a strangled cat, so I recommend you first of all focus on using a correct breathing technique, relaxing your shoulders and chest and letting your diaphragm do the work. Also, you want to make sure that your larynx doesn’t move up as you approach the top notes of the song (BTW your larynx or vocal box is the organ located in the anterior neck that contains your vocal chords). And to avoid that upwards movement, you can lift your soft palate, the same way you do when you yawn. Quick trick: to increase the awareness of your larynx’s positioning, try to hold it gently between your fingers and make sure that it stays pretty much in the same place throughout the whole song. Last but not least, keep your muscles relaxed, especially those around your throat. 3. There are various vocal licks that really help to embellish Attention (and make you show off your vocal ability when you nail them!). The key to a good execution is to have well clear in your head what all the notes that form the lick actually are. Once that’s done, it’s really important that each single note you sing sounds well-defined pitch-wise, while the lick in its whole remains nice and fluid. Whenever I’m in trouble I resort to the same “magical” process: I slow down the lick’s melody until it becomes really comfortable and separate each note with a consonant (i.e. na-na-na…). Then, I gradually speed up the way I sing the lick, making sure my pitch is really accurate before I go any faster. I keep going until I reach the actual tempo of the original recording. At this point I remove the consonant and repeat the process, starting from slow and ending at the song’s original tempo. This trick has never failed me. I guarantee, if you follow the same process you’ll be able to sing whatever lick in an accurate and fluid way. 4. The last point is less technical and more stylistic. The arrangement of Attention is really sharp rhythm-wise and you definitely want to convey the same feel with your vocal interpretation. Pay attention to the last word of each line and make sure it’s got a very short tail. I’ve had a bit of fun recording the song using all the vocal techniques and tricks described above. You can check me out in the video below and contact me at [email protected] with any questions you might have. Also, feel free to link to this article or share it on Social Media if you think that any of your friends may benefit from it.